Our phones are our most prized possessions. They keep the most valuable information about us and that is why it is crucial to keep them safe at all times. I recently bought the iPhone X, which is a real treat, but gosh did it turn out to be a slippery little scoundrel. At first, I was reluctant to get it a case because it would ruin its looks. But, at the same time, I understood the consequences of keeping it bare and insecure. I would have broken it fast. Then, I ran into the Dreem iPhone X Wallet Case. Why Get a Folio Case? You might say that a phone case is just a phone case. No matter what type, it will do the job of protecting the phone just fine. Well, I beg to differ. Most of the time, regular cases are made from cheap plastic and rubber, causing them to wear off quickly. In addition to that, the phone’s screen is not really protected. The sides rise just a few millimeters above the screen and that serves no purpose if the phone falls onto something that does not have a flat surface. Folio cases protect our phones in all hazardous situations. Be it falling, dropping or spilling something on them. Furthermore, they are often made to be used as wallets as well! Speaking about killing two birds with one stone. 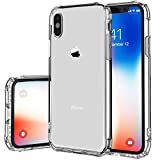 If you share my opinion that it is better to have one full pocket than a couple, you will find these types of cases, and especially the Dreem iPhone case , very appealing. On the other hand, if you have a problem with a bit of bulkiness, you might want to stick with the regular old slim case. Safety – Folio cases provide more security than slim cases. Especially when it comes to screen-protection. Looks – To me, slim cases do nothing else but ruin the phone’s look. Folio cases, however, make the phone appear more valuable because they keep it hidden. Multi-functionality – Folio cases allow you to dispose of your wallet and go minimalist. No unnecessary cards and receipts. Just the essentials. Apart from promising an unparalleled level of durability, comfort, and practicality, the Dreem iPhone X case has brought a touch of class to my life. The leather makes it look luxurious and the slim case within it is detachable for those times when you want to leave your minimalist wallet behind. You get space for your credit cards, driver’s license, and daily receipts, as well as creases which help turn the case into a horizontal or vertical stand. 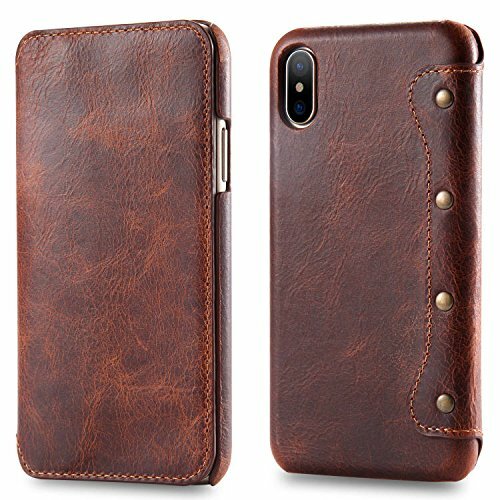 Compared to the HZ BIGTREE iPhone X case , which is a great item, the Dreem iPhone case makes you look more mature, provides more protection, and is a phone wallet. To put it plainly, it is prettier, safer, and multi-functional. 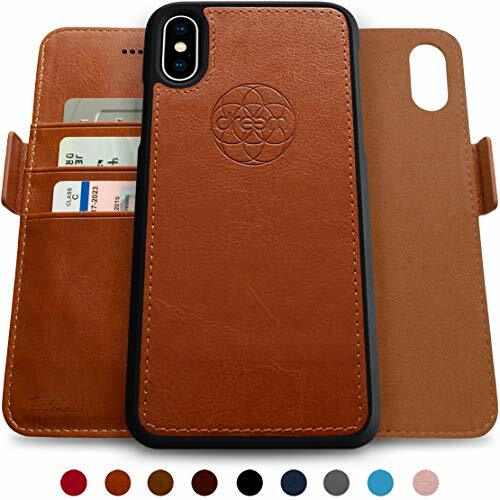 My suggestion would be, in case you are interested in merging two of the most essential accessories (wallet and phone case) together, to give the Dreem iPhone case a chance. Of course, if folio cases are simply not your thing, I am afraid that this review will not be helpful in any way to you. 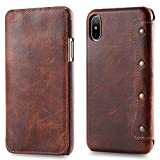 Dreem iPhone X Wallet Case – What is There to Know? The most prevalent material used to create the Dreem iPhone case is faux leather. Keep in mind that we are talking about vegan leather! When you hold the case in your hands you just know that you are dealing with something valuable. Even when you detach the slim case, it feels solid. The stitching is done as precisely as it could be all around the wallet. 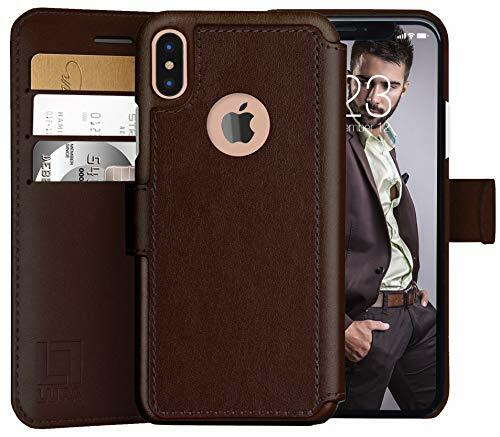 It perfectly compliments a luxurious phone like the iPhone X.
I think that the Dreem iPhone case serves as a better wallet than most slim wallets for men. It contains three interior card pockets which can easily fit up to 8 cards (credit or business), as well as some cash and a few receipts. Best of all, when you do fill it up, it does not become bulky! Lastly, each of the three card pockets is RFID protected! The Dreem iPhone case has a built-in magnet which holds the slim case in place. Trust me, I have never had a phone case which instills a greater sense of safety in me than the Dreem. The clasp is very easy to open. You can just use your thumb to push open the front cover without ever touching the clasp! Also, the creases are positioned in such a way that allows you to either create a horizontal or vertical stand for your phone. One for facetiming, the other for watching your favorite shows. You can imagine what kind of an attention seeker this wallet case actually is. Therefore, when you go online to check out other people’s opinions and choices like exentri wallet, you stumble upon some high praise. Give Me Some Options, Man! Since I respect other people’s preferences, here is a simple but durable iPhone X slim case. Made from top-grade TPU material (non-slippery and abrasion-resistant), the HZ BIGTREE provides cushioned corners and raised bezels for extra safety. The speaker hole is also protected in order to prevent dust from reaching to them. 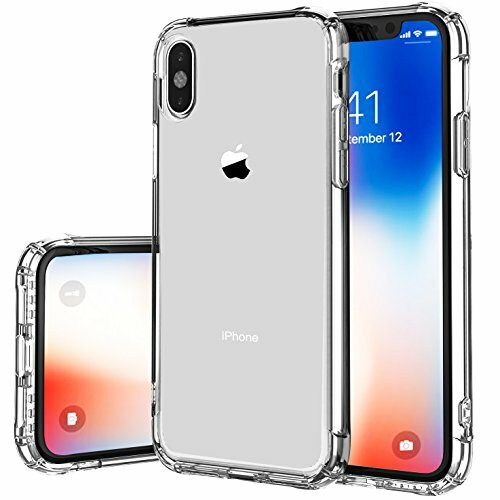 Top Quality TPU Material – The protective case is made from top grade TPU material that is super soft and comfortable to hold.What’s more, it is anti-scratch, shockproof and non-slippery. Great User-Friendly Design – Speaker hole closed design prevent dust very well. The case cover reserved hang rope hole increased service performance of the cellphone and let your mobile phone portable & easy-carry anywhere. Purchase Without Risk – We committed to provide the best product with the great customer service let you buy our products without any risk.Just freely contact us if you have any questions. Here is a German made genuine cowhide leather folio case. Apart from looking exceptional, it will keep your phone safely tucked in underneath the leather lid. Of course, when you pull the front lid all the way to the back, you create yourself a stepless stand! Oh yes, it also includes a money pocket and a couple of card slots. The Lupa wallet case is around $20 cheaper than the Dreem iPhone case. It provides enough space for up to 4 credit cards and a few bills. Since it is made from premium eco-friendly faux leather the case will not quickly wear off. The magnet in the clasp is very strong and it provides an additional layer of safety. Travel Lighter: Holds an iPhone X, 3-4 credit & ID cards and up to 4 bills (more than other brands!). Full access to all ports. Ultra-strong magnetic closure provides security & peace of mind. Durable Protection: Covers all four corners of your iPhone and includes raised edges to prevent screen scratches. Made to Last: Rugged, eco-friendly & lightweight PU leather resists stretching & fading over time and even stands up to the occasional splash or drop on the ground. My humble opinion is that the Dreem iPhone case is one of the best looking, most practical and easy to use wallet cases on the market. I am thoroughly in love with it. 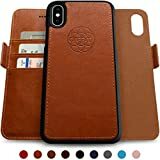 It helped me get rid of my disorganized wallet and provided extra protection for my invaluable iPhone X. Due to its RFID protection and snug pockets, all of my cards are safe and securely held in place. All of you in search of a luxurious yet highly practical wallet case, make sure to check out the Dreem iPhone case .